STAMFORD, Conn.--(BUSINESS WIRE)--WWE (NYSE: WWE) and Susan G. Komen® will continue their partnership for the sixth consecutive year to celebrate everyday heroes making a difference in the fight against breast cancer, encouraging them to “Be Strong, Act Bold, Always Believe,” a sentiment echoed by WWE Hall of Famer The Ultimate Warrior®. This year WWE created a commemorative, limited edition “Unleash Your Warrior” t-shirt that is available for purchase at WWEShop.com and at WWE live events, with 100 percent of net proceeds benefiting Komen research grants focused on metastatic breast cancer, a disease that is responsible for most of the nation’s 40,000 annual breast cancer deaths. Fans also have the option of donating $1, $5, or $10 upon checkout, with all proceeds benefiting Komen. WWE will utilize its global platforms including WWE Network, TV broadcasts, live events, PSAs, and digital and social media to generate awareness and encourage action. Throughout the month of October, the WWE announcer table, entrance ramp, ring skirts and digital signage will be co-branded, and the middle ring rope turned pink to promote the fight against breast cancer. WWE Superstars will wear co-branded “Unleash Your Warrior” apparel, and breast cancer survivors along with those still battling the disease, will be honored on WWE’s flagship TV programs, Monday Night Raw® and SmackDown® Live, both airing live on USA Network. 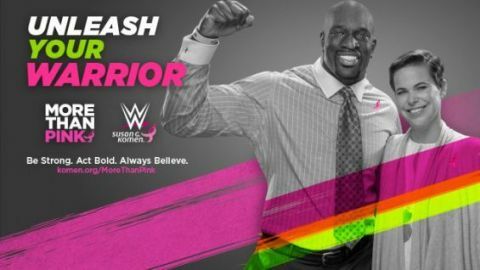 The “Unleash Your Warrior” campaign continues the history of success between Komen and WWE. The partnership launched in 2012 with the successful “Rise Above Cancer” campaign, and to-date, has raised $2 million for breast cancer research, education and screening. You can learn more about this partnership by visiting www.komen.org/wwe as Komen continues working toward their Bold Goal of reducing the nation’s 40,000 breast cancer deaths by 50 percent by 2026. Forward-Looking Statements: This press release contains forward-looking statements pursuant to the safe harbor provisions of the Securities Litigation Reform Act of 1995, which are subject to various risks and uncertainties. These risks and uncertainties include, without limitation, risks relating to: WWE Network; major distribution agreements; our need to continue to develop creative and entertaining programs and events; the possibility of a decline in the popularity of our brand of sports entertainment; the continued importance of key performers and the services of Vincent K. McMahon; possible adverse changes in the regulatory atmosphere and related private sector initiatives; the highly competitive, rapidly changing and increasingly fragmented nature of the markets in which we operate and greater financial resources or marketplace presence of many of our competitors; uncertainties associated with international markets; our difficulty or inability to promote and conduct our live events and/or other businesses if we do not comply with applicable regulations; our dependence on our intellectual property rights, our need to protect those rights, and the risks of our infringement of others’ intellectual property rights; the complexity of our rights agreements across distribution mechanisms and geographical areas; potential substantial liability in the event of accidents or injuries occurring during our physically demanding events including, without limitation, claims relating to CTE; large public events as well as travel to and from such events; our feature film business, including anticipated release, marketing or involved talent for upcoming titles and productions; our expansion into new or complementary businesses and/or strategic investments; our computer systems and online operations; privacy norms and regulations; a possible decline in general economic conditions and disruption in financial markets; our accounts receivable; our revolving credit facility; litigation; our potential failure to meet market expectations for our financial performance, which could adversely affect our stock; Vincent K. McMahon exercises control over our affairs, and his interests may conflict with the holders of our Class A common stock; a substantial number of shares are eligible for sale by the McMahons and the sale, or the perception of possible sales, of those shares could lower our stock price; and the relatively small public “float” of our Class A common stock. In addition, our dividend is dependent on a number of factors, including, among other things, our liquidity and historical and projected cash flow, strategic plan (including alternative uses of capital), our financial results and condition, contractual and legal restrictions on the payment of dividends (including under our revolving credit facility), general economic and competitive conditions and such other factors as our Board of Directors may consider relevant. Forward-looking statements made by the Company speak only as of the date made and are subject to change without any obligation on the part of the Company to update or revise them. Undue reliance should not be placed on these statements. For more information about risks and uncertainties associated with the Company’s business, please refer to the “Management’s Discussion and Analysis of Financial Condition and Results of Operations” and “Risk Factors” sections of the Company’s SEC filings, including, but not limited to, our annual report on Form 10-K and quarterly reports on Form 10-Q.